Set force_hostname to be the Drupal url and path in Discourse site settings. Eg Drupalsite | Dr. Olav Schettler This will give correct links in emails sent by Discourse. “force_hostname” doesn’t exist in my Discourse instance. Has this been deprecated? Also noticed the Drupal Module was tested with Discourse 1.2.0.beta5 and Discourse is on ver 1.4. Has anybody tried this module with newest Discourse? Does it work? Set force_hostname to be the Drupal url and path in Discourse site settings. Eg Drupalsite | Dr. Olav Schettler This will give correct links in emails sent by Discourse. That’s very wrong. The referenced setting is restricted to development mode only because of people doing stupid things like that. Sounds like it’s trying to set up subfolder. You can do that with hosted forums, but it’s a bit expensive. Reading the page, seems like it doesn’t offer much other than SSO? In that case, might as well skip it. The module is trying to embed Discourse into Drupal, so instead of using Drupal Forums you’re using Discourse. Doesn’t look like the module works though. It’s doing some whacky monkey patch with Ember to get Discourse to run on the Drupal page. Not looking like a robust, quick and easy solution to get Discourse in Drupal. I hope that saves some time for others! 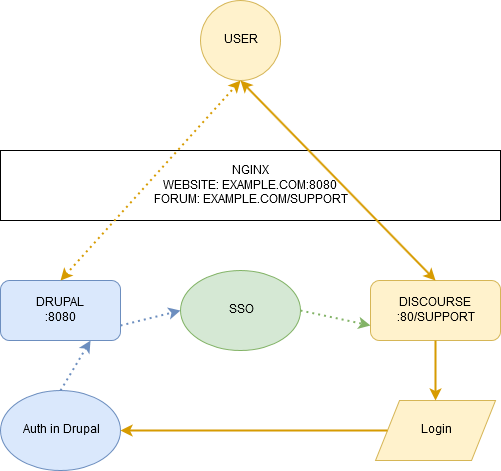 Let me share our implementation of SSO based on Drupal 7.56 and Discourse 1.9.0.beta7 using discourse_sso plugin. I have tried the plugin on the subject, even OAuth2 integration but the most interesting were this one. Unfortunately, there is no enough information how to force SSO to run, even Readme does not contain useful information. For that reason, I decided to publish my live configuration. On test environment, both services, Discourse and Drupal are located on the same server as virtual servers managed by Nginx. Both services are managed by two separate config files (see below). The sources how to install Discourse and Drupal are here and here. I have to mention that Discourse is the main service in our case (because Drupal is more flexible to tune), it uses port 80. But as desired by our team, the forum has moved from root (/) folder to /support folder. The guide I used for this is located here but the settings are described below as well. Next, Drupal website operates on port 8080 on the same server. Fill Discourse site URL with your Discourse URL (our case: http://example.com/support). Fill SSO secret with your secret token. sso secret - fill the same secret token as used above in Drupal. Open your forum in private browser and click ‘Login’. If above settings were configured properly, you will be redirected to Drupal site. Enter your credentials and next second you will be redirected back to the forum. p.p.s. Disable option ‘email editable’ in Discourse admin settings to prevent using a single Drupal account to recreate Discourse user if the email was changed by a user. 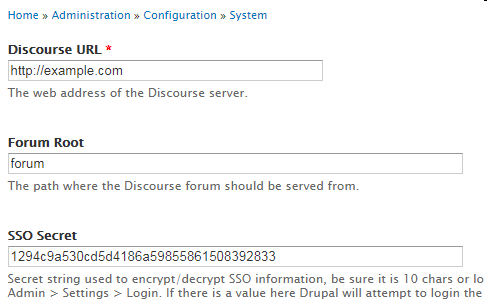 Hi, there is another SSO solution for Drupal 7 and Discourse tested on beta13. in my case forum works from folder /forum. You may use both discourse sso plugins mentioned above.